Ok, Google! What Song is this! What song is this?..is the million dollar question that nags your brain when a stray floating tune of a popular song comes your way and you can’t place it. Some even more when the OCD kicks in. With the boom of digital media and music culture going into overdrive, the probability of ending up in this situation just got worse. Dozens of digital records get released every minute and get sold by the millions every second. Every one of us music freaks has been in the situation where our playlist outgrew our device memory, it’s not hard to imagine our mind doing so too. So it’s not very rare, when you are in a party or in a friend’s car and a song is running, to be like “Wait! !..I know that song” and scrounge your brain, start humming it and such until your curiosity gets the better of you and you end up shouting What song is this? What is the name of this song? or Ok Google, What song is this? Well, you need not worry anymore. Thanks to Digital Signal Processing Techniques, voice recognition and processing has scaled new heights. Apps and websites implementing this phenomenon are here to help you find that elusive song. Here is a few of the best out there. The next time you hear a song that you love and want to identify it but couldn’t find your smartphone, don’t fret. Online music identification services are just as effective and functional albeit not so convenient as apps or virtual assistants. They require microphones in case you don’t have one built-in or want you to upload a part of the song. But when it comes to functionalities, they are no lesser beings. From top notch interfaces to advanced algorithms, they have it all. Let us take a look at the top two web platforms. If you have heard about SoundHound then you would probably know how good these guys are. Advertised as the “ultimate music search tool”, Midomi lives up to it. It is a well-organized web platform with a huge database that can help you find that tune that’s been stuck in your head. It uses the microphone in your device to get the input for performing the search. All you need to do is hum the part of the tune into the microphone and sit back to watch the algorithms do their magic. Its advanced search engines are capable of recognizing your humming or even whistling. Now that’s cool. Alternatively, you can sing the song or move the microphone near the player environment and midomi will catch the song for you. Searching is a bit on the slower side but that won’t matter as it’s a free platform. AudioTag is a free music recognition web platform that allows you to identify almost any piece of music that’s been nagging you. The process is quite straightforward. The user has to upload a clip or fragment (recommends a min of 15 sec) or the whole song. Alternatively, you also have the option of entering the URL of the location where you found that song. 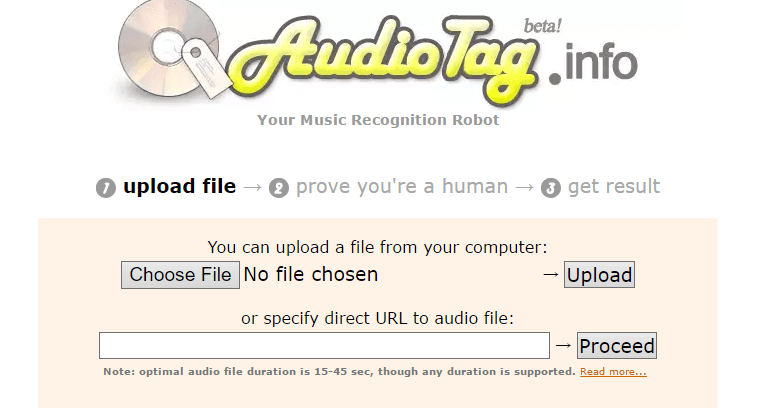 Once done, the website verifies if you are human-standard procedures, and then the site’s robot or the algorithm works on the file and returns with the information about the track title, artist name, album title, etc. Your audio clip can be in any file format and of almost any quality (recognizable, of course). It can be a file downloaded from the Internet in MP3 format or a recording made with your old tape recorder as a low-quality WAV-file. Using a mobile application to perform day to day stuff is the most preferred method these days. That said, the natural choice for identifying a song would probably be apps and rightly so, what with the convenience they offer and technology in play, why look anywhere else. This is the most popular music recognition app out there Hands down. It has been rated the best in almost all trusted websites and is top ranked in Android play store and Apple’s app-store. It has a massive database of songs and more than 12 billion music tags. So if you are ever left wondering what song this is?..look no further than shazam. What is more interesting is the fact that even native voice recognition apps like Siri makes use of shazam to identify songs being searched. The landing page of this app is minimalistic yet modern. It listens to whatever is playing around you regardless of the source, be it a TV or radio, matches the digital footprint with its database and in seconds comes up with the name of the track, the artist, and information such as lyrics, video, artist biography and recommended tracks. It even links you to services like iTunes, Amazon, Spotify. The free version allows you to search 5 different tracks per month while the paid version which charges $4.99. It’s all well and good if you know the lyrics or the song is playing nearby. But what happens when a tune is stuck in your head and all you can do is hum. 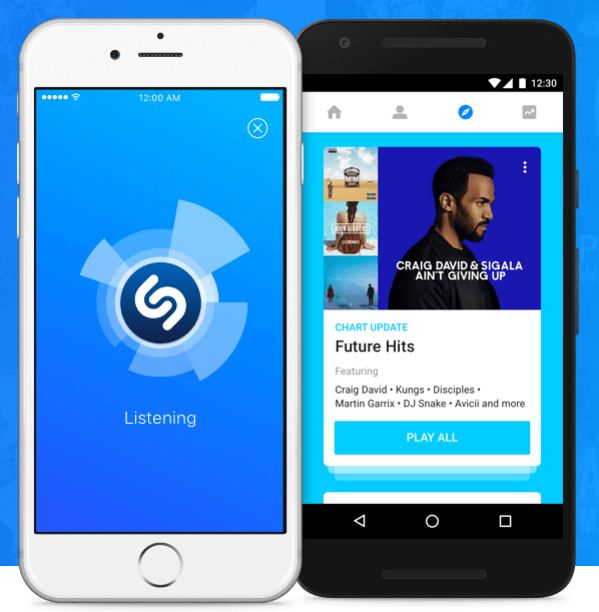 SoundHound can find the song for you and still work as fast as shazam. The app can find a song even if you hum or sing just a part of it and it doesn’t miss often too. Launching the app brings you to a simple user interface. Alternatively, you can also launch it by saying “ok hound..”, which is kinda cool. The results have all the bells and whistles as shazam and you can go a step more and post your results on social media. It supports all popular platforms including windows and blackberry. It’s available to download for free with ads and in-app purchases. This is the largest lyrics database where users search and share song lyrics. It has a powerful lyrics recognition engine that identifies what song you are looking for based on the song’s lyrics since most of the searches are performed for lyrics. It is capable of displaying lyrics in real-time and even syncs with your default mobile player. Once installed, it can scan all the songs in your device and download the relevant details along with lyrics. You can tag your songs, share them and even save the lyrics for offline use. The downside is that the accuracy falls way short of the competition. Support 32 languages in different countries. It’s available for platforms like android, android tablet, Windows, IOS, and windows phone. Choosing a service for your music recognition needs depends solely on perspective, whether you choose to hum the song or sing it, the above platforms just get the job done. This is one of the many reasons why they still thrive in spite of native apps like Siri, Google Now and Cortana, that come installed in latest devices, and can perform music recognition but still fall short in user acceptance. 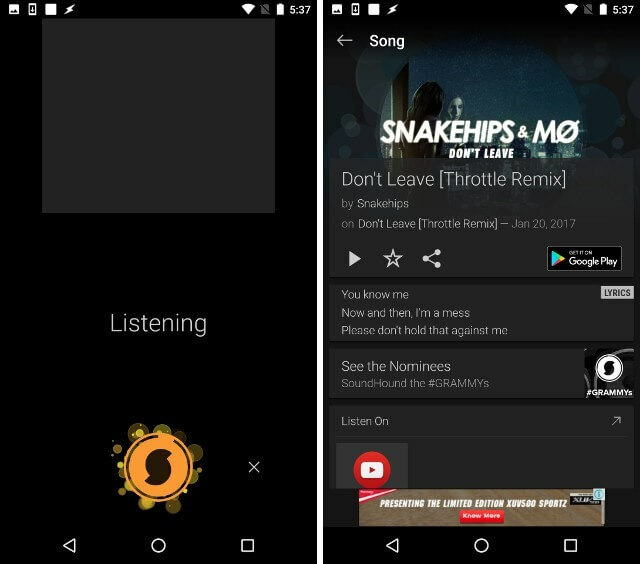 When looking at user interfaces, shazam is perhaps the best, giving you lots of options to play with while soundhound has voice control options to listen better to your humming. Its music player is a bonus. MusiXmatch is an app for all supporting any language you can think of and is a lyricist’s dream. But whichever service you based on your preference, one thing is for sure, you will be impressed. Previous articleHow to Delete Photos from Facebook? Wow, This post helped my identifying songs, this is Awesome.